Why You Should Take Advantage Of The Kindle Countdown! Do you read books digitally yet? Do you have a smartphone or a tablet? If so then you need to know about the Kindle Countdown! 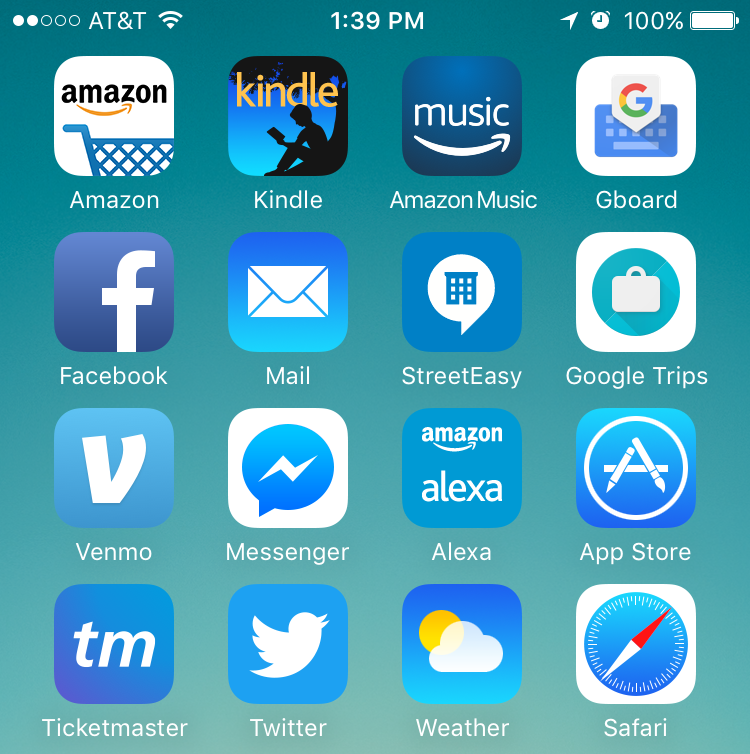 Before you say “but I don’t have a Kindle!” don’t worry, neither do I. I download books from Amazon.com to the Kindle App, which is free. It means I can read my books on any of my devices, from my Smartphone to my tablet (I use an iPad but it works on any tablet) to my laptop. Initially I wasn’t into it, preferring to have the tangible experience of holding a physical book. But I also used to like playing music on C.Ds. Now all my music is digital, either coming to me via iTunes or Pandora. I didn’t get on board with reading digital books until I started getting frustrated by having to waste space and weight on physical books while traveling. No one travel guide has everything you want, so I would end up with 2 or 3 travel books as well as however many novels I wanted to read while I was away. It was ridiculous. So that’s how I got my first digital books. I got the Kindle App on my iPad (which automatically went to all of my devices) and started reading them there while traveling. After a while it just became the easiest way to read books. My library connected with a service called Overdrive who then delivered library books to the Kindle App for me to read – it was (and is) fantastic! When I wrote my book Glam Italia! How To Travel Italy my initial plan was for it to only be available as a digital book because I wanted everyone to have help at their fingertips while traveling in Italy. But Amazon has print-on-demand, so it made sense to offer it as a paperback as well. As I started reading books on the Kindle App Amazon started sending me emails with other books I might like, at a discount. The Amazon algorithm looks at the books you have liked and give 5 stars to and then finds books that other people have also bought when buying the books you enjoy. All good so far – but it gets better! Authors can’t really discount their hardcopy books too much because of the costs involved in manufacturing them. Digital books have no manufacturing costs, only a small downloading fee for the author, and as such can be discounted. Amazon allows authors who meet certain criteria to do a Kindle Countdown every so often. This happens over the course of 5 days. The book will start as low as 99 cents or $1.99 and then go up in price by $1 each day of the countdown, before going back to the regular sales price. When you buy books through Amazon on the Kindle App the algorithm will email you each week with Kindle Countdown book deals for books you would like. It’s fantastic! They know my favorite authors, so when there is a book at 99 cents or $3.99 or wherever it is in the sequence, I get an email and can download it with one click. It means that I can read a book for $1.99 or whatever the price is that day instead of paying $19.95 for the paperback. This week my book Glam Italia! 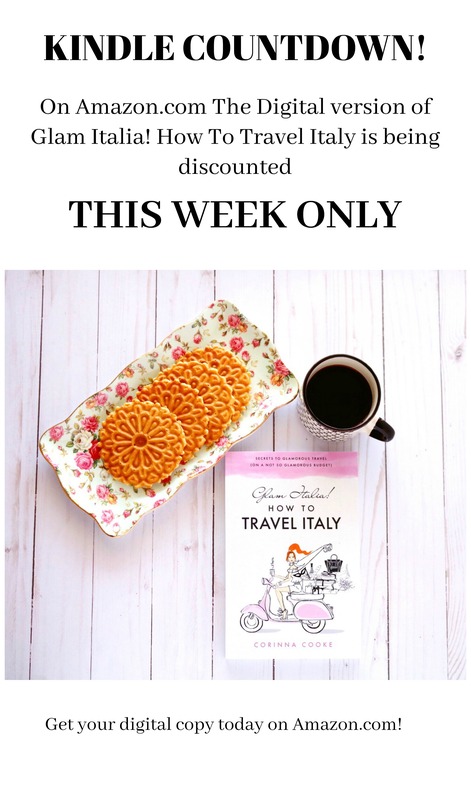 How To Travel Italy is on the Kindle Countdown. Starting today, Monday October 22nd, the digital edition of my book is only $1.99. Tomorrow it will be $2.99. Each day this week it goes up in price by $1 and then on Saturday goes back to its normal price of $9.95. This is the perfect time to download the book! If you have friends or family members interested in doing a trip to Italy at some point, you can even gift them a copy. All they have to do is download the Kindle App and the book will appear there under the All Books tab. It’s so easy! One of the things I love to do as I prepare for a trip is to watch as many movies as I can that are set in the country I am traveling to, and read books that take place in that country or ideally in that specific city. This clues me in to lots of cool things to look out for, things that I wouldn’t otherwise have known about, and it also gives that frisson of excitement when you recognize something from a book or movie that you have loved. I love geeking out and walking to the places in Florence and Rome that Dan Brown sends his characters to in the Angels and Demons/ Da Vinci Code/ Inferno series. In Paris I get ridiculous amounts of pleasure from hitting the places Owen Wilson goes to in the movie Midnight In Paris. The steps he sits on when he gets picked up at midnight would be completely unremarkable to anyone who hasn’t seen the film, but to all who have seen it there is a thrill in sitting on them and having someone take your photo! Every year I say I want to spend more time in Venice. Most of my Glam Italia Tours only spend a day there, and although I arrive in Italy before my tour groups get there and generally stay on a few extra days at the end, I never seem to be getting that extra time in Venice. I always find myself in Tuscany or in Rome or somewhere at the beach. This past June (2018) I gave myself a week in Venice. I had a tour that ended with 3 days there, then spent another few days by myself doing all the things I hadn’t been able to do in ages. It was completely fantastic. Of course I geeked out and went to visit many of the places that feature in the endless books I have read that are set in La Serenissima and had ridiculous amounts of fun doing it. Venice is such a magical city, it is very hard to let go of it once you return home. So, of course I am up to my ears in books set there. I recently discovered a series by Donna Leon that I am now halfway through, and I am going to reread some of my old favorites as well because they are just so good! RELATED POST: WHAT YOU NEED TO KNOW ABOUT KINDLE UNLIMITED, AND HOW TO GET MY BOOK FOR FREE! Here is a list of 10 books set in Venice that I recommend you read before you go. I have also attached a link at the bottom of this post with 10 of my secret things to do in Venice, for those of you who want to experience more than the average tourist does. This includes my favorite restaurants, places to wander and things to visit that will keep you away from the tourist crush. It is well worth downloading! Scroll to the bottom of this post to get them. John Berendt wrote Midnight In The Garden Of Good And Evil. Shortly after the film of the book was made he moved to Venice, arriving the day after the world famous La Fenice opera house burned to the ground. 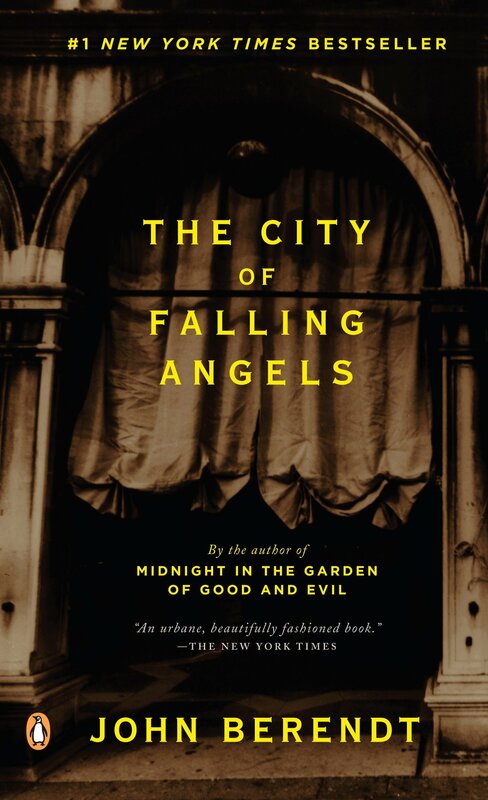 The City of Fallen Angels is an hilarious and brilliant look at Berendt’s life in Venice, his entry into the quirky local society, and his investigation into the opera house fire. In between gondola rides to decadent parties and balls, and his exploration of the most unique city on earth, he also uncovers all kinds of art-world intrigue. This book will forever change the way you look at the iconic Santa Maria della Salute, (beware of falling angels!) will give the Guggenheim a whole new context, and will lead you to some wonderful things you would otherwise walk right past. I had walked past the little church of Santa Maria dei Miracoli a hundred times, not knowing the story of the New Yorkers behind Save Venice and the restoration they did on the church. As told by Berendt the story is both funny and endearing! This year I made my Venice guide walk me around the places in The City of Fallen Angels that I hadn’t been able to find on my own. The poor guy has no idea what I have in store for him next year! I really do make lists of places from the books I read, and sometimes I make my guides take me to them. If you want a really amazing and fun guide for Venice, email me at the address on the About Me page, and I will hook you up! I only discovered this series when I got home from Venice this summer, and I have already consumed half of it! 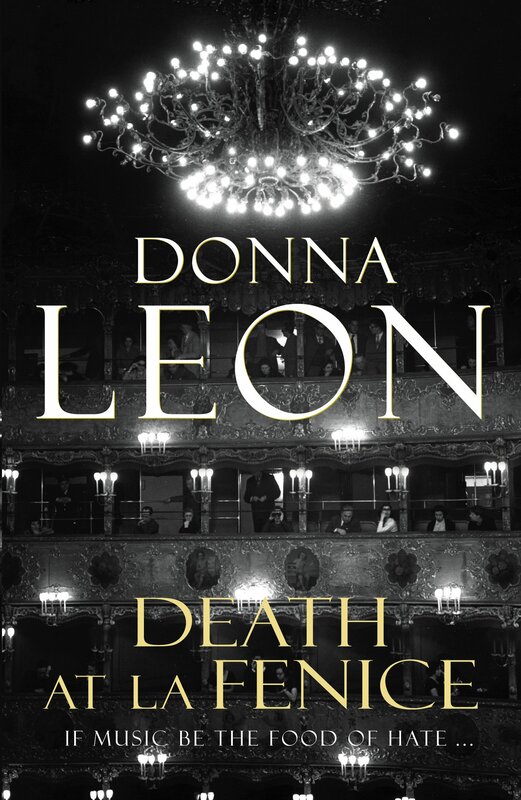 Donna Leon’s stories are set in Venice with her protagonist Commissario Guido Brunetti of the Venice police. Her mysteries are clever and have the requisite twists and turns to keep you hooked until the last page. Brunetti is the kind of character that keeps you coming back for more. Even if she had set these books somewhere else I would have read them all, but the fact that they are in Venice just makes them even better! 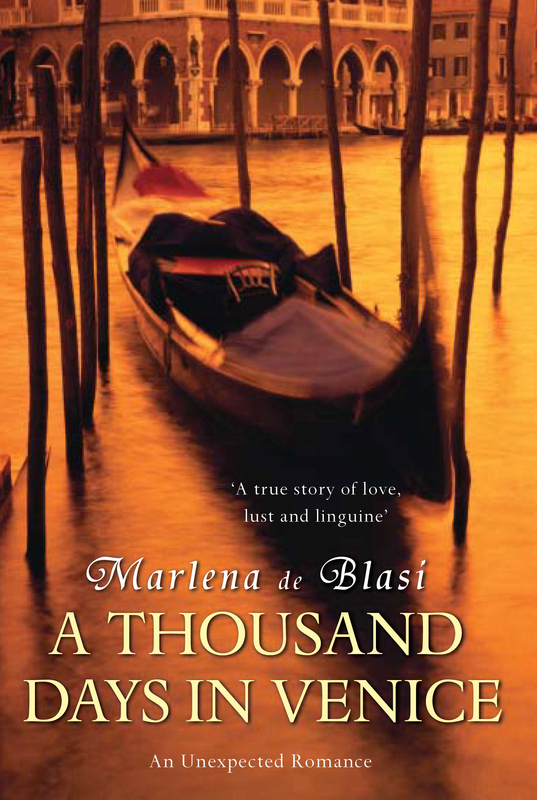 This is de Blasi’s autobiography, written as a combination of a lush travel essay and a romance. While in Italy writing for a travel magazine chef and food and travel writer Marlena de Blasi was told she had to go to Venice, a city she had always avoided, to write a story. After dreading going there she found she loved it, so returned the following year with a group of girlfriends. While having coffee on their first day a waiter approaches and tells her there is a phone call for her. She refuses it as no one knows she is there. This happens every morning that week until her final day in Venice when she agrees to come to the phone. The caller is Fernando, a banker who had spotted her across the piazza the year before and had fallen in love with her profile. After daydreaming about her for 12 months he had walked into his daily coffee bar that first morning and seen her sitting there! Too nervous to approach her he had run back to the bank and then phoned to try and talk to her. On the final day after talking to him on the phone Fernando and Marlena rode around Venice on the vaporetto, and the love affair of a lifetime began. Within a few months she had sold her restaurant and her house in St Louis and moved to Venice. This book tells the story of their first three years together. if you have ever dreamed about falling in love in Venice, this is the book for you! In Brunetti’s Venice, tourists and armchair travelers follow in the footsteps of Brunetti as he traverses the city he knows and loves. 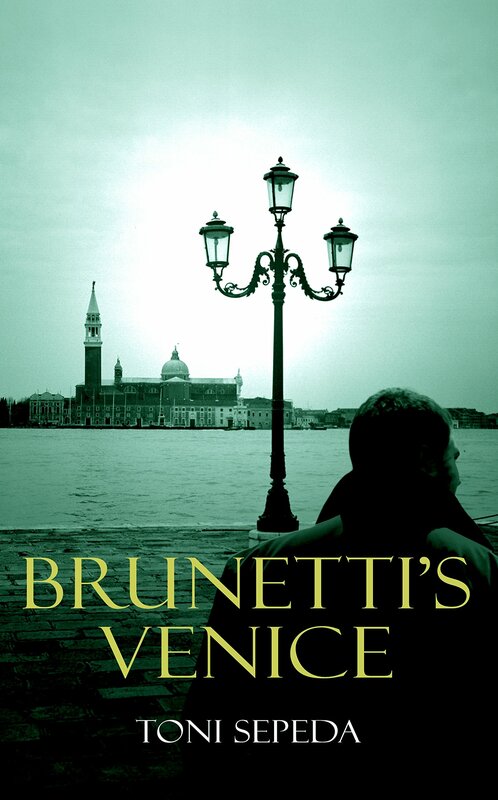 With his acute eye for change in his native city, his fascination with the past, his ear for language and his passion for food and drink, and his familiarity with the dark realities of crime and corruption, Brunetti is the perfect companion for any walk across La Serenissima. Over a dozen walks, encompassing all six regions of Venice as well as the lagoon, lead readers down calli, over canali, and through campi. Important locations from the best-selling novels are highlighted and major themes and characters are explored, all accompanied by poignant excerpts from the novels. This is a must-have companion book for any lover of Donna Leon’s wonderful mysteries. I read this on the plane to Italy this summer. I’m not normally a romance reader, but at some point had bought this book on my Kindle app, and it had been sitting there forever. Having finished my John Milton book during the flight and with hours still to go, I clicked on it not expecting to like it, but I couldn’t put it down! 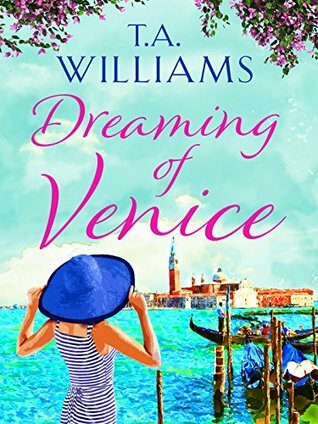 Dreaming Of Venice is a good little story to read, especially if you are going to Venice or if you are dreaming about going to Venice. Williams gives an really good description of the leading man in the book, an enigmatic character with a pirate-styled black beard. On my first day back in Venice this summer I did a huge double-take when I spotted the man who surely had to be the inspiration for this book! At first I thought I imagined it, but then I saw him several more times and am 100% sure, because two people could not be more similar, even if one of them is a fictional character! If you spot him and think its the guy in the book you have to message me! 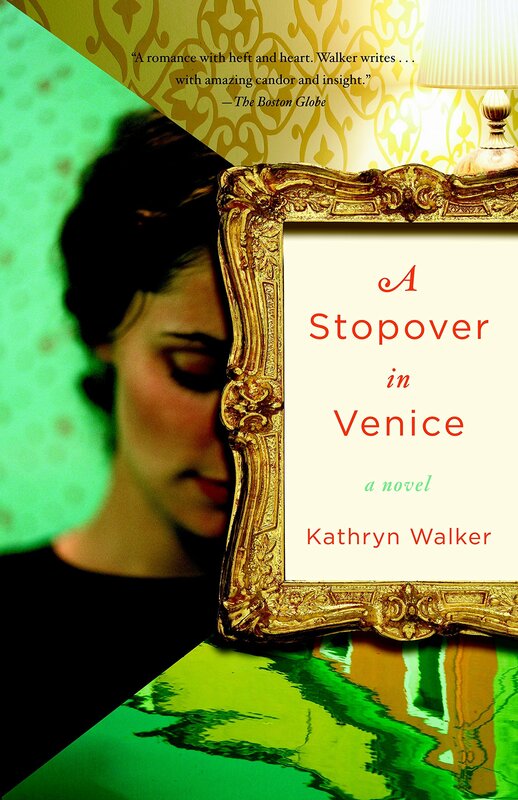 I read this book years ago and was actually clicking around on google trying to find it when I came up with the idea of doing a post on books set in Venice. I had forgotten them name of the book and the author, and only found it by typing in details that I could remember about the story. I loved this book and am looking forward to re-reading it soon. 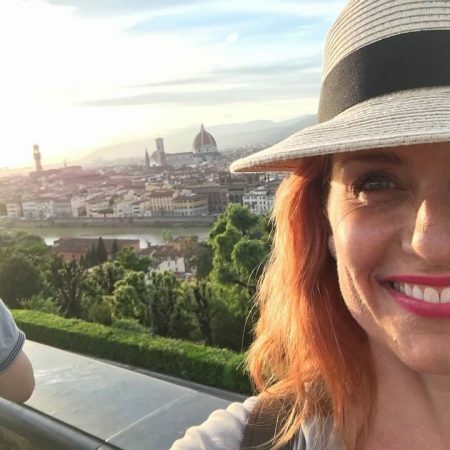 Nel Everett, a young American woman, is touring Italy with her famous musician husband when, in a moment of fury, she pulls down her luggage and gets off the train. As her life speeds away down the tracks, Nel is marooned and on her own for the first time in eight years. Bewildered, Nel returns to Venice where she encounters a tiny dog who leads her to a enigmatic stranger, a contessa, and a decaying Gothic palazzo. She is soon drawn into a world of charismatic characters, centuries of Venetian history, and the mystery of a lost masterpiece. What begins as a tale of loneliness and heartbreak opens into a dazzling, enchanting story of secrets and self-discovery in a magical city. 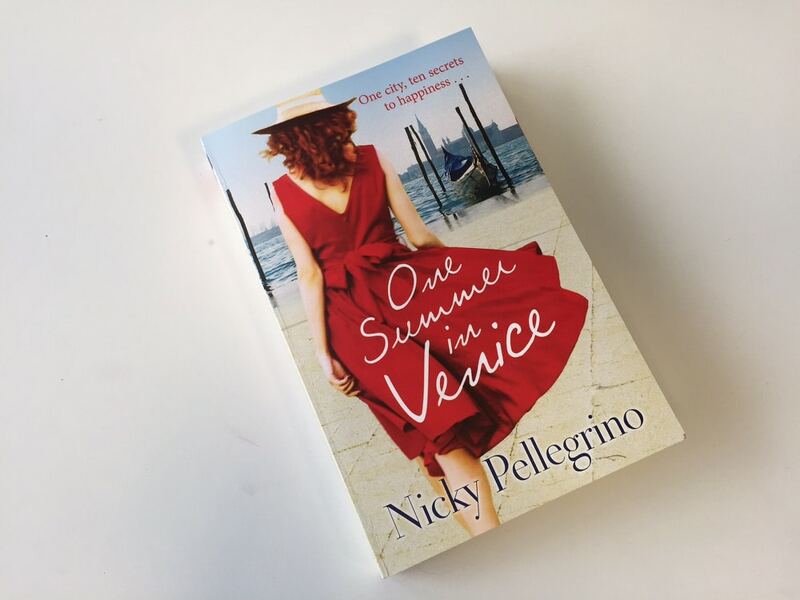 Nicky Pellegrino lives in my home country, New Zealand, and writes books set in Italy. I first discovered her when I came home from a summer in Sicily and had to read everything I could get my hands on that was set there. She had written a gorgeous book that left me aching even more to go back. Addolorata Martinelli knows she should be happy. She has everything she thought she wanted – her own business, a husband, a child. So why does she feel as if something is missing? Then when her restaurant, Little Italy, is slated by a reviewer, she realises that she’s lost the one thing she thought she could always count on, her love of food. So Addolorata heads to Venice for a summer alone, aiming to find the ten things that make her happy. Once she’s found them, she’ll construct a new life around her ten things, but will they include her life in London? My lady, Fiammetta Bianchini, was plucking her eyebrows and biting color into her lips when the unthinkable happened and the Holy Roman Emperor’s army blew a hole in the wall of God’s eternal city, letting in a flood of half-starved, half-crazed troops bent on pillage and punishment. 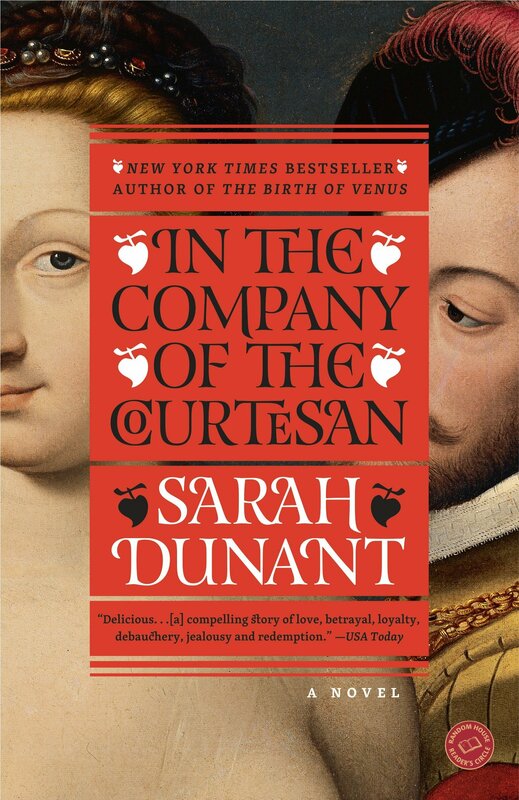 Thus begins In the Company of the Courtesan, Sarah Dunant’s epic novel of life in Renaissance Italy. Escaping the sack of Rome in 1527, with their stomachs churning on the jewels they have swallowed, the courtesan Fiammetta and her dwarf companion, Bucino, head for Venice, the shimmering city born out of water to become a miracle of east-west trade: rich and rancid, pious and profitable, beautiful and squalid. With a mix of courage and cunning they infiltrate Venetian society. Together they make the perfect partnership: the sharp-tongued, sharp-witted dwarf, and his vibrant mistress, trained from birth to charm, entertain, and satisfy men who have the money to support her. Yet as their fortunes rise, this perfect partnership comes under threat, from the searing passion of a lover who wants more than his allotted nights to the attentions of an admiring Turk in search of human novelties for his sultan’s court. But Fiammetta and Bucino’s greatest challenge comes from a young crippled woman, a blind healer who insinuates herself into their lives and hearts with devastating consequences for them all. A story of desire and deception, sin and religion, loyalty and friendship, In the Company of the Courtesan paints a portrait of one of the world’s greatest cities at its most potent moment in history: It is a picture that remains vivid long after the final page. Of course I am going to put my book on here! This genius book, written by me, isn’t actually about Venice specifically, although I do talk about Venice. Glam Italia! 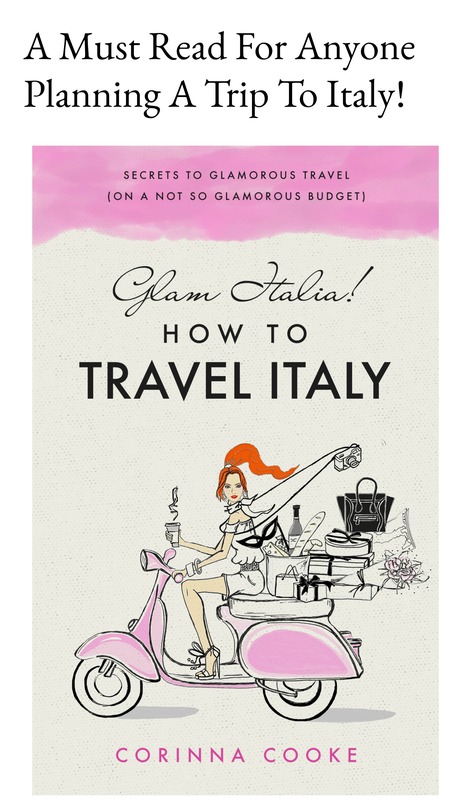 How To Travel Italy is essential reading for anyone planning or dreaming of a trip to Italy. This book helps you to plan your trip, figure out where to go, where to stay, how many nights to stay in each place. We look at transport options, how to get from city to city, from village to township. There is an entire section of the book devoted to helping you while you are on the ground in Italy. From what you need to know about shopping to how to choose a restaurant, from how to order coffee to a step by step guide on how to use the trains. Italy food and wine is entirely regional. You don’t order lasagna on the Amalfi Coast and you don’t order chianti in Venice. Glam Italia! How To Travel Italy has a guide for which wines to order in each region of the country and a guide to help you choose local dishes in each region. You will learn what to do if you get sick while you’re away, and what to do if your plans go sideways. You will also discover what you need to know about beachlife in Italy, how to work your money, and how to work your phones. There are 26 chapters packed full of really helpful information, peppered with some of my personal travel stories. 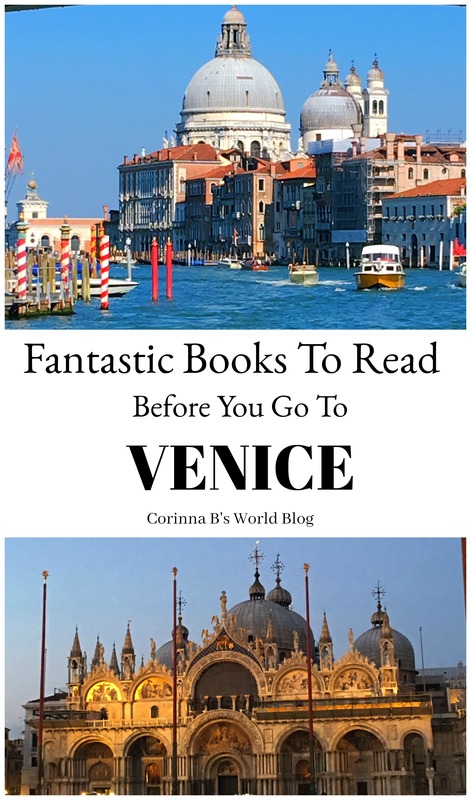 Have you read any fabulous books set in Venice? I am always looking for more, so please let me know in the comments section below! 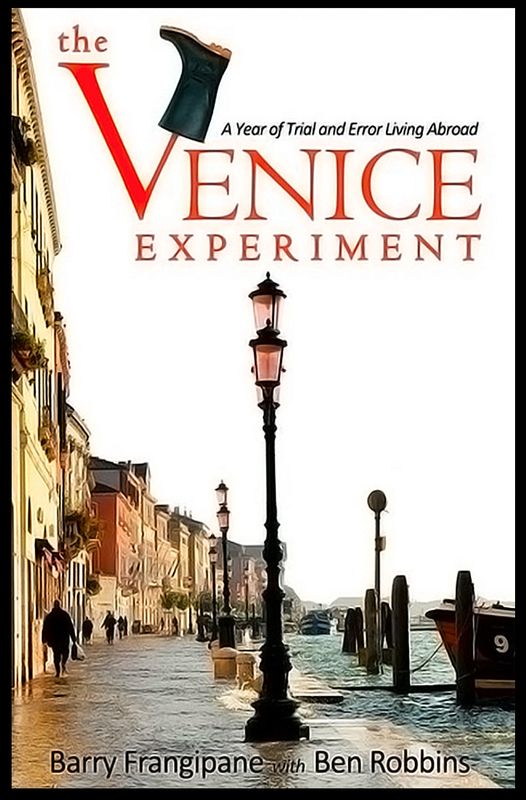 I have created a downloadable PDF with 10 of my secret places to visit in Venice. These are places that most tourists don’t know about and don’t go to, including my favorite restaurants, favorite places to wander around and some really great spots that you will just love! 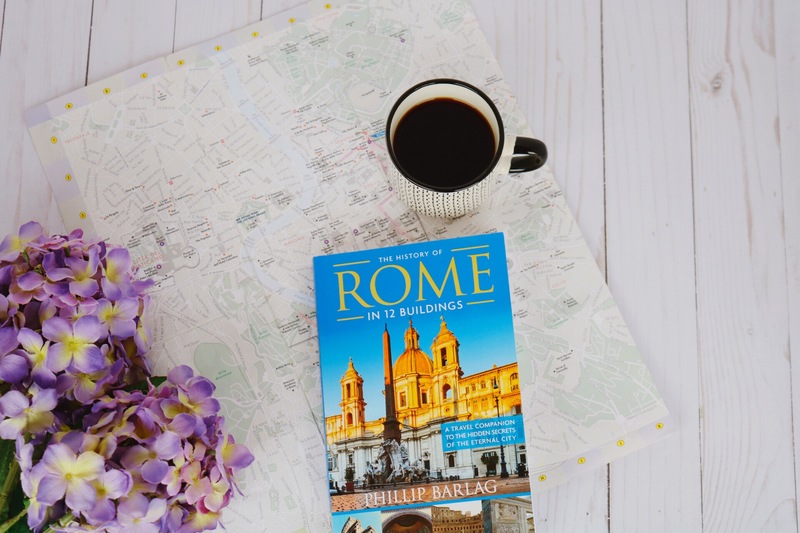 If you are planning a trip to Rome, or have been to Rome, you need to know about this book. This post contains Amazon affiliate links. See Disclosure Page for details. I have been reading, underlining, ear marking pages and sticking post it notes to this fabulous new book by Phillip Barlag. is a fantastic way of exploring Rome, learning about its history and at the same time learning about some intriguing buildings. Of the 12 buildings there are three of the usual suspects, the Colosseum, Piazza Navona and the Pantheon, but the author’s view of them and the information he gives shed another new light on them. Even if you have been to these buildings a hundred times over as I have (well, maybe not 100, but definitely more times than I can count) you will still gain something new from reading these chapters. The remaining 9 buildings he takes you to are fascinating and although within walking distance of the Colosseum, quite possibly haven’t yet made it onto your itinerary. From the Mamertine Prison to the Mausoleum of Augustus to Ara Pacis, there is something new for everyone! If you are already familiar with all 12 buildings in the book you will still take away something new. Rome is huge, and its sprawl can feel overwhelming to a traveler. There have been times when I haven’t ventured out to see a site or monument because it has just seemed too far, only to find later that it was in fact quite close. In the book Barlag uses a well known site, the Colosseum, as the starting point from which you head out to each of his buildings, telling you that with your back to the Colosseum this is a 15 minute walk. (Or however long it takes.) This gives you an easily understandable concept of where everything is. He also gives you the metro stop for each site, and knowing that travelling is hungry work he gives you the names and addresses of his favorite restaurants close by. As he closes each chapter he also gives you another building nearby that either bridges the story or the space between the one you’ve just read about and the next. It is fantastic! If you’ve been following this blog for more than 5 minutes then you will already know that I love Rome. I adore Rome. I can’t wait to get back to Rome (in just a few weeks from writing this post) and will be taking this book with me when I go back. 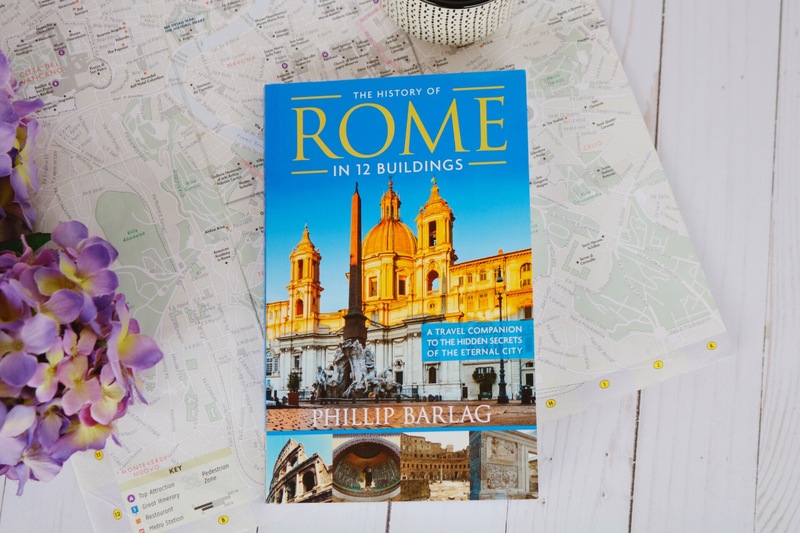 Buy it for yourself if you plan on ever going to Rome or if you want to re-live memories of this magnificent city. Buy it for family or friends who are going to Rome. Please also take the time to leave me a comment once you have read The History Of Rome In 12 Buildings – you will love this book, and I love hearing from you!